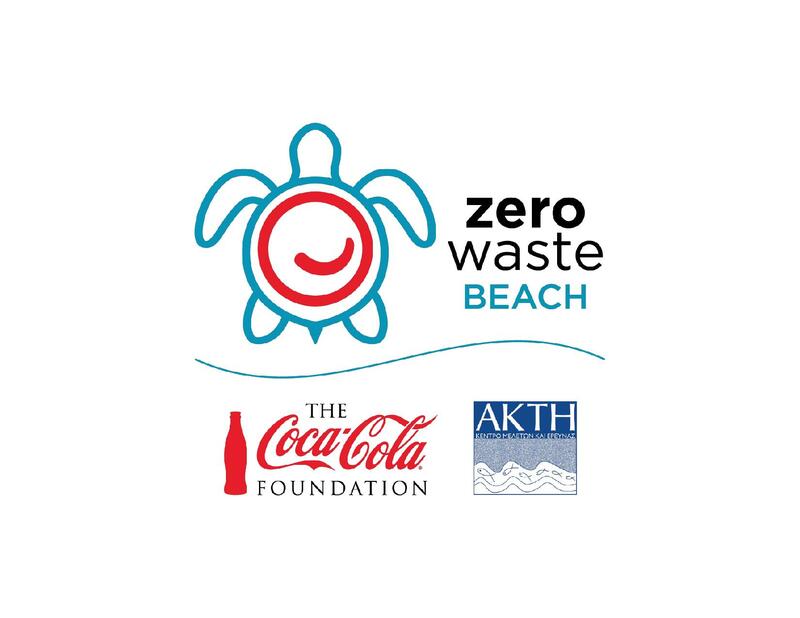 AKTI Project and Research Centre implemented the project «ZERO WASTE BEACH», which was supported by Coca-Cola Foundation in an attempt to tackle marine litter. Marine litter is an increasing cross-sectoral global challenge with no geographic/political boundaries. Plastic has been recognized as the most abundant and persistent form of marine litter globally, with a recent study suggesting that more than 5 trillion plastic pieces are currently floating around the world’s oceans. In its larger forms (e.g. plastic bottles, six-pack rings, plastic bags, fishing-related items) plastic can cause the entanglement and suffocation of marine wildlife. Plastic does not biodegrade, but rather breaks down into continuously smaller pieces, called microplastics (less than 5mm). In this smaller form, microplastic items can be ingested by marine wildlife transferring all the organic pollutants that they accumulated as they floated in water. Recent studies have shown that this can have important impacts on the food chain, as ingested microplastics have been identified in marine organisms destined for human consumption. The possible effect that this can have on human health is still uncertain. a) specifically the Coastal Businesses, and based on the “producer responsibility” mentality, to enhance their active involvement in minimizing litter that enters marine environment through the implementation of innovative, hands-on-the-problem awareness-raising and participatory measures. The project aimed to engage Coastal Businesses, i.e. beach bars, snack shacks, beach restaurants, coastal hotels etc (henceforth called coastal businesses), strewn around Cypriot beaches, to take ownership of ‘their’ stretch of beach in order to protect it and minimize the amount of marine litter, and especially plastic, left on it by their customers and in general beach goers and support them to incorporate sustainable practices in their everyday performance through suggesting solutions, encouraging creative ideas and actions and award them, to make their effort visible to their clients. b) Local Authorities and general public. Enhance their active involvement, encourage their participation in the campaigns and the solution-oriented actions, make them feel the “ownership” of clean coasts and seas, of marine litter recycling champions, of litter free coasts, “their coasts”. 1. On-the-go recycling through bins on coastal walkways and public coastal spaces: installed 50 recycling bins at Geroskipou Municipality and Kissonerga Community coastal walkways and worked with local authorities to include them in their collection routines. Collected 4.2 tons of recyclable waste from these bins, during the implementation of the project. The aim was to encourage local authorities and communities to improve collection infrastructure and implement reduction actions for plastics used. 2. Beach cleanups in conjunction with the International Coastal Cleanup: implemented annual beach cleanups on selected beaches with the collaboration of the Responsible Coastal Businesses, schools, volunteers (including Coca-Cola System employees) and local authorities. Beach cleanups were implemented between June 2018 – August 2018 (in the summer tourist season), which included 15 beach cleanups with the participation of 614 volunteers, including 110 students and representatives of 15 local authorities. For the waste registration and their separation in sources, ΑΚΤΙ uses the International Ocean Conservancy Protocol. AKTI is the national focal point in Cyprus of the International Coastal Cleanup of the Ocean Conservancy. Over 16000 litter items were collected, weighing 1.12 tons. 3. Built on the “Responsible Coastal Businesses Network” in Cyprus: that is initiated and managed by AKTI and has received the BeMed recognition (Beyond Plastics Mediterranean) for being an innovative action with strong social and environmental impact. The Responsible Coastal Businesses Network, targets owners/managers and workers at coastal enterprises. It aimed to inform them about marine litter and encourage them to participate in and implement activities that will achieve the best possible management of plastic waste, either produced within their coastal business or left behind by beach goers. Strengthened and expanded the Network, to 137 members around the island, through Implementation of an extensive awareness-raising campaign, targeting all coastal businesses on the island. To provide inspiration, a Decalogue and a Guide were developed and distributed to the Coastal Businesses. Decalogue contained 10 basic possible good practices and the Guide contained examples of these good practices in order to inspire the applicants and encourage them to act against plastic pollution and generally for a more green performance of their businesses. A prerequisite for registering a business on the network was only to “get informed” with the practices that can be implemented. For that reason, a Decalogue and Guide against plastic pollution of the sea were produced and distributed to the Coastal Businesses and other stakeholders. These, were developed as part of this activity and includes examples of best practices that can be implemented by Responsible Coastal Businesses to reduce marine litter, and especially plastics, as well as other practices to promote sustainability. 200 copies of each were produced and most of them distributed to coastal business owners and managers, and other stakeholders. 4.Tracked and recorded recycling waste from the Responsible Coastal Businesses: The members of the Responsible Coastal Businesses network ought, as a mandatory term of their network membership, to record the amount of waste (PMD, glass, general) that they dispose. 1730 tons of recycling waste collected by the responsible coastal businesses throughout the 6 months duration of the project. 5. Α Competition for the implementation of sustainable practices to reduce marine litter, and especially plastics, was launched and implemented. The Competition targeted members of the Responsible Coastal Businesses Network, in an attempt to promote sustainable practices incorporated by coastal businesses in their operation, and to minimize plastic waste entering the coastal and marine environment, thus mitigating/reducing the pollution they cause. To provide inspiration, the Guide that was developed, distributed to the Coastal Businesses, together with the terms for the participation in the Competition, the application form and a Decalogue of examples/possible good practices in order to inspire the applicants and encourage them to act against plastic pollution and generally for a more green performance of their businesses. 56 entries were received. The entries were evaluated by a five-member independent jury: the general secretary of the Pancyprian Association of Entertainment Venue Owners (PASIKA), Mr. Phanos Levendis, the Chairperson of Entrepreneurship Council – Center for Entrepreneurship at University of Cyprus, Dr. George I. Kassinis, the Public Affairs & Communications Manager at Lanitis Bros LTD, Mrs. Kalia Patsia, the officer of Quality Assurance department of CTO (Cyprus Tourism Organization), Mrs Rodoula Antoniou and the Chairperson of the Board of Directors of AKTI Mrs. Xenia I. Loizidou. The winners were selected by the jury followings a selection process based on 4 criteria: environmental responsibility, social responsibility, innovation and sustainability. 6. A highly publicized Award Ceremony, “Zero Waste Beach Awards 2018”, was implemented at the end of the project. The winners had the title of «Zero Waste Beach Champions». The ceremony took place on A. G. Leventis Gallery in Nicosia. The ceremony was attended by over 123 people, including the Minister of Agriculture, Rural Development and Environment, Dr. Costas Kadis, Ambassadors, NGO representatives, industry representatives, media and of course coastal businesses. The Ceremony was extensively covered by local and national media. The aim of the competition was to highlight the sustainable practices implemented by coastal businesses to effectively reduce their plastic waste and promoted recycling initiatives, proving that every good purpose gets even better with collective action. 7. Extensive communication and dissemination activities took place over the duration of the project, and especially at times with important activities, e.g. the project launch, the cleanup events, the competition and the awards ceremony. Communication and dissemination activities were inclusive of all means and media (print, online, social etc) and included 121 publications about the project by third parties (national circulation newspaper articles, online news portals), 14 TV appearance and 7 radio broadcasts, 61 facebook posts by AKTI, with a total advertisement equivalent of 1.48 million euro. i.e. 12.6 times more than the funding! Through these 7 axes of activities, with the implementation of innovative tools (such as recognition and awards) and solution oriented actions, this initiative targeted to minimize the waste that enters coastal and marine environment and introduce sustainable practices in the operation of Coastal Businesses, Local Authorities and general public. Because the success of recycling and waste management especially of land based litter that enters coastal and marine environment, is highly related to the hands-on participation of businesses and Authorities.